NCS Green Earth Pvt. Ltd., 1 Nagpur - 440016, Maharashtra, India. Zydus Cadilla 2, Ahemdabad - 380051, Gujarat, India. ABSTRACT: Sulphur water is commonly used as the remedial source for treating skin infections and eradicating pathogenic microbes causing infection. The sulphur water is the source of sulphur oxidizing bacteria which is the source of different secondary metabolites which has potential killing activity against different skin borne infections. In the present investigation, the study was performed to isolate and screen the sulphur oxidizing bacteria (both autotrophs and heterotrophs) from the sulphur water. Sulphur is primarily used to ease red, itchy skin. It also helps protect your body against toxins in the environment. In addition, people with arthritis may find pain relief from taking a soothing bath in hot sulphur springs. Sulphur aids in certain digestive disorders, especially acid reflux, indigestion made worse by milk, chronic diarrhea and vomiting in the morning. It also helps gynecological problems such as premenstrual syndrome and menopausal discomforts. The total of twenty six isolates were obtained from sulphur as follows: UKAK1, UKAK2, UKAK3, UKAK4, UKAK5, UKAK6, UKAK7, UKAK8, UKAK9, UKAK10, UKAK11, UKAK12, UKAK13, UKAK14, UKAK15, UKAK16, UKAK17, UKAK18, UKAK19, UKAK20, UKAK21, UKAK22, UKAK23, UKAK24, UKAK25 and UKAK26. The isolates were picked and streaked on the new sulphur oxidizer medium. Repeated picking and streaking of a well- isolated colony will ensure of obtaining a pure culture. INTRODUCTION: Sulphur is naturally found in hard water. The populations in some Mediterranean countries where the water is partially hard tend to have a low incidence in heart disease and dementia. Iceland, which is particularly blessed with sulphur-rich water (Sulphur Springs), is ranked as the healthiest country in the world, according to a Forbes report (followed by Finland and Sweden). Water softening, as well as fluoridation and chlori-nation of water strip the water of all its sulphur. This is one of the reasons sulphur deficiency is more pronounced in larger cities or communities supplied with treated, municipal water. Sulphurous waters contain at least 1 mg litre sulphydric acid (H2S) and should preferably be ingested 1. Depending on the pH of the water, the H2S is present as a whole molecule (low pH). Italian sulphur mineral waters usually exhibit pH values below 8. When they are bottled, stocked, conserved and opened, they lose their gasses. Sulphurous waters may also contain other elements such as sulphate, sodium, bicarbonate, calcium, etc. Because of the toxicity of sulphydric acid, only sulphur-bacteria and few other microorganisms can survive in sulphurous water. These waters are the most studied and their biological effects are well known on skin, respiratory and vaginal mucous membrane and gastroenteric system 2, 3, 4. Sulphur is one of the most important elements for sustaining life on earth. It was divided into organic and inorganic sulphur compounds (SC). The organic sulphur occurs as volatile compounds for example dimethyl sulphide (DMS), methanethiol (MT) and dimethyl disulfide (DMDS) which can be found in wastewater and night soil treatment plants 5. On the other hand, inorganic sulphur compounds include hydrogen sulphide, sulphite, elemental sulphur, tetrathionate and thiosulphate. The biochemical significance of sulphur is tremendous. Sulphur is required because of its structural role in the amino acids cysteine and methionine, and because it is present in number of vitamins, such as thiamine, biotin and lipoic acid, as well as in coenzyme A 6. There are many sources of inorganic sulphur compounds be presented on earth. These include geological, biological and anthropogenic sources of sulphur. Volcanoes, hot springs and hydrothermal vents are the major natural sources of reduced sulphur compounds. Besides that, industrial activity including petroleum and natural gas extraction and refining, pulp and paper manufacturing, rayon textile production, chemical manufacturing, agricultural and waste disposal add inorganic sulphur compounds to the environment 7. Sulphur undergoes number of biological transformation in nature carried out exclusively by microorganisms. The transformations of inorganic sulphur compounds in nature have been formalized in the so-called sulphur cycle. The microorganisms that participate in sulphur cycle are physiologically diverse and comprise both heterotrophic and autotrophic organisms 8. Microorganisms that are capable of oxidizing reduced inorganic sulphur compounds with sulphate as the end product are known as sulphur oxidizing bacteria (SOB). Most of the known sulphur-oxidizing bacteria belonging to genera Thiobacillus, Thiothrix, Beggiatoa, Thiomicrospira and Achromatium 9. The sulphur-oxidizing bacteria can be isolated from acid, neutral or alkaline environments, form cold, moderate or hot habitats, as well as from low to highly saline waters and soils. In sulphur cycle, nature balances the inorganic sulphur oxidations through the biological reduction of sulphate to sulphide. The process of sulphate reduction is synonym to hydrogen sulphide (H2S) production or sulfidogenesis, as a result of sulphate-reducing bacteria (SRB) metabolism. Sulphides ion or hydrogen sulphide gases are highly undesirable in the environment because of acute neuro-toxicity towards human and animals and are corrosive to metallic infrastructure. Many literatures have been enlightened regarding microbial capacity to enzymatically oxidize sulphide. Sulphide oxidase is the key enzyme responsible for the catalysis of sulphide ions oxidation 10. Sulphur is a multivalent non-metal, abundant, tasteless and odorless. In its native form sulphur is a yellow crystalline solid. In nature it occurs as the pure element or as sulphide and sulphate minerals. The crystallography of sulphur is complex. Depending on the specific conditions, sulphur allotropes form several distinct crystal structures. The major derivative of sulphur is sulphuric acid (H2SO4), one of the most important elements used as an industrial raw material. Sulphur is also used in batteries, detergents, fungicides, manufacture of fertilizers, gun power, matches and fireworks. Other applications are making corrosion-resistant concrete which has great strength and is frost resistant, for solvents and in a host of other products of the chemical and pharmaceutical industries. Life on Earth may have been possible because of sulphur. Conditions in the early seas were such that simple chemical reactions could have generated the range of amino acids that are the building blocks of life. Sulphur occurs naturally near volcanoes. Native sulphur occurs naturally as massive deposits in Texas and Louisiana in the USA. Many sulphide minerals are known: pyrite and marcaiste are iron sulphide; stibnite is antimony sulphide; galena is lead sulphide; cinnabar is mercury sulphide and sphalerite is zinc sulphide. Other, more important, sulphide ores are chalcopyrite. The chief source of sulphur for industry is the hydrogen sulphide of natural gas, Canada is the main producer. Sulphur is now considered the fourth major plant nutrient after N, P and K and is one of the sixteen nutrient elements which are essential for the growth and development of plants, especially in the agricultural crop production. This is mainly because of its widespread deficiency in the soil world over. The importance of sulphur is equal to that of nitrogen in terms of protein synthesis, and in terms of crop uptake it exceeds even that of phosphorus. The majority of sulphur taken up by plant roots is in the form of sulphate (SO4), which undergoes a series of transformations prior to its incorporation into the original compounds. The soil microbial biomass is the key driving force behind all sulphur transformation. The biomass acts as both a source and sink for inorganic sulphate. The latter make sulphate available from element sulphur or any reduced forms of sulphur through its oxidation process in the soil. The role of chemolithotrophic bacteria of the genus Thiobacillus in this process is essential. The objective of this study was to isolate and characterize the sulphur oxidizing bacteria from various sources. Sulphide and thiosulphate are the most abundant reduced inorganic sulphur species in the environment and converted to sulphate primarily by bacterial action in the sulphur cycle. Sulphides are detrimental in the environment because of the toxicity to human health and corrosive effect on concrete and metallic infra-structure, besides it strong unpleasant smell 11, 12, 13, 14, 15, 16. While thiosulphate is one of the intermediate product of sulphide oxidation process in sulphur cycle and considered as important in nature. The use of microorganisms able to remove reduced inorganic sulphur compounds in nature has been considered as a potential alternative. Oxidation of reduced inorganic sulphur compounds especially sulphide and thiosulphate was exclusively carried out by sulphur-oxidizing bacteria. The ability of sulphur-oxidizing bacteria to oxidize sulphide was contributed to an enzyme system present in the cell known as sulphide oxidase and sulphate is the expected end product of reduced inorganic sulphur compounds oxidation by the sulphur-oxidizing bacteria. The potential for oxidation of inorganic sulphur compounds, such as sulphide and thiosulphate is widely spread among the bacteria. Most of the known sulphur-oxidizing bacteria are members of the so-called ‘colourless sulphur bacteria’ belong to genera Thiobacillus, Thiothrix, Thiomicrospira, Beggiatoa and Achromatium. However, there are many heterotrophic bacteria especially those belonging to the γ-subdivision of the proteobacteria that are capable of oxidizing thiosulphate and sulphide. Most of the example of heterotrophic bacteria belongs to the genera Pseudomonas, Xanthomonas, Halomonas, Escherichia coli and Klebsiella (Gommers and Kuenen, 1988). It is especially important for humans because it is part of the amino acid methionine, which is an absolute dietary requirement for us. The amino acid cysteine also contains sulphur. The average person takes in around 900 mg of sulphur per day, mainly in the form of protein. Elemental sulphur is not toxic, but many simple sulphur derivates are, such as sulphur dioxide (SO2) and hydrogen sulphide. Sulphur can be found commonly in nature as sulphides. During several processes sulphur bonds are added to the environment that are damaging to animals, as well as humans. These damaging sulphur bonds are also shaped in nature during various reactions, mostly when substances that are not naturally present have already been added toxic. They are unwanted because of their unpleasant smells and are often highly toxic. Sulphur can be found in the air in many different forms. It can cause irritations of the eyes and the throat with animals, when the uptake takes place through inhalation of sulphur in the gaseous phase. Sulphur is applied in industries widely and emitted to air, due to the limited possibilities of destruction of the sulphur bonds that are applied. Laboratory tests with test animals have indicated that sulphur can cause serious vascular damage in veins of the brains, the heart and the kidneys. These tests have also indicated that certain forms of sulphur can cause foetal damage and congenital effects. Mothers can even carry sulphur poisoning over to their children through mother milk. Finally, sulphur can damage the internal enzyme systems of animals 17, 18. Description of a Study Area: Sahastradhara, located at a distance of around 14 km from the heart of the city, is a popular tourist attraction of Dehradun. Literally meaning “thousands fold spring”. Owing to the presence of sulphur in the water of this spring, it is believed to have medicinal value. The water of this sulphur has lime, which contributes towards the formulation of projecting ridge that eventually takes the shape of a cave. 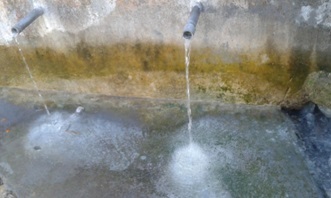 Sample Collection: The sample sulphur water was collected from Sahastradhara. The sulphur water was collected in plastic cans were taken to laboratory for isolation and screening of sulphur bacteria. Microbiological Media: Selective medium containing sodium thiosulphate was used for isolation and enrichment of microorganism. Thiosulphate was supplemented in this medium as a sulphur source to the microorganism. It has been used as a preferred sulphur compound for sulphur-oxidizing bacteria laboratory studies, due to its stability at neutral pH and metabolized by all sulphur-oxidizing bacteria. The media employed for the isolation of sulphur oxidizing bacteria include Starkey broth composed of 3.0 g KH2PO4, 0.2 g MgSO4.7H2O, 0.2 g CaCl2.2H2O, 0.5 g (NH4)2SO4, traces of FeSO4 in 1000 ml distilled water with pH 8.0; NCL broth consisted of 0.2 g (NH4)2SO4, 0.5 g MgSO4.7H2O, 0.25 g CaCl2 2H2O, traces of FeSO4, in 1000 ml of distilled water with pH 3-5. Bromo cresol purple was the indicator used. For isolation of heterotrophic oxidizers 5.0 g of glucose per liter of Starkey and NCL broth was added. Elemental sulphur at 10 g per liter was added to Starkey and NCL broths and half-an-hour steam sterilized for three consecutive days. One ml of the sample was added to 20 ml of the broth dispensed in tubes, under aseptic conditions. The tubes were incubated in BOD incubator at 32 ºC for 25 days. The isolates obtained were purified by transferring to fresh broth thrice at fortnightly intervals. The pure isolates were then streaked on thiosulphate agar medium and individual colonies were obtained. The single colonies were picked and preserved on thiosulphate slants. The pure cultures were labeled and used for characterization and further studies. Isolation of Sulphur Oxidizing Bacteria: Isolation was performed by using sample collected from Sahastradhara sulphur water of Dehradun (U.K). Isolation was performed by using direct plating method. The sulphur sample was poured onto the sulphur-oxidizer medium agar. The sample was spread evenly on the sulphur-oxidizer medium plate using the sterile glass spreader. The plates were incubated at 30 ºC for 24 h. The well defined isolated colonies appeared on the plate were picked up by wire loop and restreak on the other sulphur-oxidizer medium agar plate for purity confirmation. Screening of Isolates by pH Reduction Test: The obtained isolates were inoculated in the growth media with initial pH adjusted to 8.0 and incubated at 32 ºC for 15 days. The final pH of the growth media was measured using a pH meter. The isolates were screened for their efficiency to reduce the pH from 5.0 to 8.0 or less than 5.0. The selected isolates were further studied for their morphology, gram reaction and colony characters. Negative Staining: The negative staining requires an acidic stain such as nigrosin. Due to the negative charged chromogen and negative charge on the cell wall of bacteria, the stain does not penetrate the cell and cells remain unstained which are easily distinguish against the coloured back ground. The technique does not require heat fixation. It is useful for those bacteria which are difficult to stain. Gram Staining: Thin smear of the cultures was made on separate glass slides. Smear was air dried and heat fixed. Covered the smear with crystal violet for 30 sec then washed with distilled water. After that covered the smear with gram’s iodine solution for 60 sec and washed with decolorizer and after that with distilled water. Applied safranin for 30 sec and washed with distilled water. Stained slides were air dried and examined micro-scopically. For colony characterization Starkey agar and thiosulphate agar media were prepared with pH adjusted to 8.0. The isolates were plated in sterile petri dishes by the pour plate method and the plates incubated at 32 ºC for 15 days. Colony characters were observed after the incubation period. Utilization of Sulphur Sources: The isolates were studied for the utilization of elemental sulphur and thiosulphate broth. They were inoculated in both the sterilized broths (initial pH 6.0) and incubated in the BOD incubator for 15 days. The growth was assessed by pH reduction and microscopic observation. Selection of Suitable Media for Autotrophic and Heterotrophic Sulphur Oxidizing Bacteria: Starkey broth with initial pH of 8.0 was prepared with and without glucose. The isolates were inoculated and incubated at 32 ºC for 15 days. Based on the pH reduction of the broth with and without glucose, the isolates were classified as chemoheterotrophs and chemoautotrophs. Hetero-trophic isolates were also inoculated in NCL and thiosulphate broth prepared with glucose. Autotrophic isolates were inoculated in the same broths prepared without glucose. Inoculated tubes were incubated at 32 ºC for 15 days. Control tubes and three replications were maintained. The pH of the broth was recorded after the incubation period. Isolation and Characterization of Bacteria from Sahastradhara Sulphur Springs: A total of twenty six isolates were obtained from sulphur sample and named as follows: UKAK1, UKAK2, UKAK3, UKAK4, UKAK5, UKAK6, UKAK7, UKAK8, UKAK9, UKAK10, UKAK11, UKAK12, UKAK13, UKAK14, UKAK15, UKAK16, UKAK17, UKAK18, UKAK19, UKAK20, UKAK21, UKAK22, UKAK23, UKAK24, UKAK25 and UKAK26. The isolates were picked and streaked on the new sulphur oxidizer medium. Repeated picking and streaking of a well-isolated colony will ensure of obtaining a pure culture. The single colony obtained on the agar was considered as a pure isolate containing only one type of microorganism. The assumption is made based on that each viable cell can yield one colony. Earlier studies on isolation of sulphur oxidizing bacteria by various researchers reveal their existence in mud soil, canal water, other fresh water sources (Kelly and Harrison, 1988) and acid streams. The strains, Thiobacillus ferrooxidans and other Thiobacillus sp. were isolated from uranium mines. A similar organism was also reported from garden soil, activated sludge and soil sulphur compost. The results of the isolates characterization are presented in Table 1 and Fig. 2. Invariably, all the organisms were short rods and gram negative, but differed in the utilization of sulphur sources. The heterotrophic colonies were smooth, round straw yellow coloured, and autotrophic colonies were smooth, raised, pink colour. Similar results were reported by several workers who isolated from soil compost sulphur oxidizing bacteria which were short rods and morphologically similar to Thiobacillus. Legend: utilized (+), unutilized (-). Screening of Bacterial Isolates for Sulphur Oxidation: All the 26 isolated colonies were subjected to undergo a screening process Table 2. Some researchers isolated thiosulphate oxidizing organisms from thermal springs. Heterotrophic isolates of thiosulphate producing bacteria, which acidified the medium moderately by ca. 0.5 to 1.0 pH units, were obtained from marine sediments and hydrothermal vents. The isolates show pH reduction (initial 8.0, final ≤ 5.0 in 15 days). The pH reduction of the medium was due to the production of sulphuric acid. Reduction in pH of the growth medium by sulphur oxidizing bacteria was reported. The isolates reduced the pH to 4.5 and 5.5 (control 8.0) of the Starkey and NCL broth respectively, within 12 days and utilized both elemental sulphur and thiosulphate. Utilization of Sulphur Sources: The heterotrophic isolates utilized glucose, where as the autotropic isolates did not utilize glucose. The present study emphasizes the importance ant the role of sulphur oxidizing bacteria in the oxidation of sulphur in sulphur water. These Thiobacillus isolates can be incorporated to enhance sulphur oxidation in water and to increase sulphur water available sulphate. Also, the pH reducing property of sulphur oxidizing bacteria by the production of sulphuric acid can be utilized for reclamation of alkali soils. Colony Character: The heterotrophic colonies were found smooth, round, straw yellow colour. The heterotroph isolates were found to utilized glucose. The autotrophic colonies were found smooth, raised pink colour and did not utilized glucose. CONCLUSION: The present study, thus suggested that, sulphur water is the prominent source of sulphur oxidizing bacteria. These bacterial inoculants possessed the characteristic metabolites which are having significant pharmacological properties. The study can lead to the basis for purification and characterization of such metabolites and formulation of effective skin disinfectant agents for the formulation of drug and antibiotics. Moreover, the present study also lead to the determination and elucidation of molecular basis of sulphur oxidizing bacterial strains which might be sharing the phylogenetic relationships. Some new bacterial and fungal strains can also be isolated and interpreted for production of some active molecules of medical or agriculture importance. ACKNOWLEDGEMENT: The authors acknow-ledge the research staff and colleagues of R&D project on the concerned topic. Aneja VP and Cooper WJ: Biogenic Sulphur Emission: A Review. Biogenic sulphur in the environment. ACS Symposium Series. Washington: American Chemical Society 1978; 393: 2-13. Agency for Toxic Substances and Disease Registry. Safeguarding Communities from Chemical Exposure 2018; 1-3. Yousuf HM and Samsuddin AA and Halimi MS: Isolation and characterization of sulphur oxidizing bacteria isolated from hot spring in Malaysia for biological deodorization of hydrogen sulphide in chicken manure. Media Peternakan 2017; 40 (3): 178- 187. Rawat S and Rawat R: Colorless sulphur oxidizing bacteria from diverse habitats. Advances in Applied Science Research 2015; 6(4): 230-235. Rai Y, Harman G, Kaur M and Sidhu N: Isolation and identification of moderately thermophilic iron oxidizing and sulphur oxidizing bacteria at Indian sub-continent. IOSR Jou of Pharmacy and Bio Sci 2013; 5(4): 19-24. Vardanyan NS and Vardanyan AK: New sulphur oxidizing bacteria isolated from bioleaching pulp of zinc and copper concentrates. Universal Journal of Microbiology Research 2014; 2(2): 27-31. Fatemi F, Rashidi A and Jahani S: Isolation and identification of native sulphur oxidizing bacterium capable of Uranium extraction. Progress in Biological Sciences 2015; 5(2): 207-221. Tamura K, Stecher G, Peterson D, Filipski A and Kumar S: MEGA6: molecular evolutionary genetics analysis version 6.0. Mol Biol Evol. 2013; 30(12): 2725-9. Barbosa-Jefferson VL, Zhao FJ, McGrath SP and Magan N: Thiosulfate and tetrathionate oxidation in arable soils. Soil Biol Biochem 1998; 30(5): 553-559. Huber B, Herzog B, Drewes JE, Koch K and Muller E: Charactterization of sulphur oxidizing bacteria related to biogenic sulphuric acid corrosion in sludge digesters. BMC Microbiology 2016; 16(153): 1-11. Bernhardt ES, Palmer MA, Allan JD, Alexander G, Barnas K, Brooks S, Carr J, Clayton S, Dahm C, Follstad-Shah J, Galat D, Gloss S, Goodwin P, Hart D, Hassett B, Jenkinson R, Katz S, Kondolf GM, Lake PS, Lave R, Meyer JL, O’Donnell TK, Pagano L, Powell B and Sudduth E: Synthesizing U.S. River restoration efforts. In Science 2005; 308: 636-637. Wei S, Jiang Z, Liu H, Zhou D and Sanchez-Silva M: Microbiologically induced deterioration of concrete: a review. Braz J Microbiol. 2013; 44(4): 1001-1007. Cho KS, Hirai M and Shoda M: Degradation charac-teristics of hydrogen sulfide and methanethiol, dimethyl sulphide and dimethyl disulfide by Thiobacillus thioparus DW44 isolated from peat biofilter. J Ferment Bioeng 1991; 71: 384-389. Cho KS, Hirai M and Shoda M: Degradation of hydrogen sulphide by Xanthomonas sp. strain DY44 isolated from peat. Appl Environ Microbiol 1992; 58(4): 1183-1189. Dam B, Mandal S, Ghosh W, Gupta SKD and Roy P: The S4-intermediate pathway for the oxidation of thiosulphate by the chemolithoautotroph Tetrathiobacter kashmirensis and inhibition of tetrathionate oxidation by sulfite. Res Microbiol 2007; 158: 330-338. Das SK, Mishra AK, Tindall BJ, Rainey FA and Stackerbrandt E: Oxidation of thiosulfate by a new bacterium, Bosea thiooxidans (strain BI-42) gen. nov., sp. nov.: Analysis of phylogeny based on chemotaxonomy and 16SRibosomal DNA sequencing. Int J Sys Bacteriol 1996; 46(4): 981-987. Starosvetsky J, Zukerman U and Armon RH: A simple medium modification for isolation, growth and enumeration of Acidithiobacillus thiooxidans (syn. Thiobacillus thiooxidans) from water samples. J Microbiol Meth. 2013; 92(2): 178-82. Wei S, Jiang Z, Liu H, Zhou D and Sanchez-Silva M: Microbiologically induced deterioration of concrete: a review. Braz J Microbiol 2013; 44(4): 1001-1007. Koul A, Hattewar J, Mathur A and Raina N: Screening of sulphur oxidizing bacteria from sulphur springs of Sahastradhara region of Dehradun, Uttarakhand, India. Int J Pharm Sci & Res 2018; 9(11): 4984-91. doi: 10.13040/IJPSR.0975-8232.9(11).4984-91. Authors Address: NCS Green Earth Pvt. Ltd., Nagpur, Maharashtra, India.